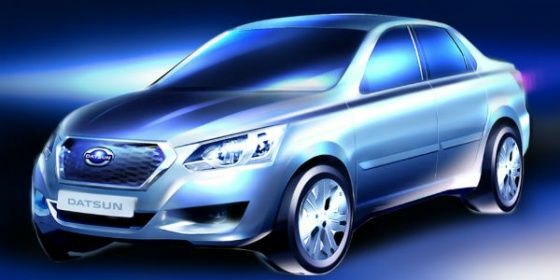 Datsun has unveiled what might be final car to be based on the Go platform, a Go sedan. The Go has already spawned a hatchback and an MPV. And at the recently concluded Auto Expo in Delhi, it showcased a concept revealing the Go in mini-SUV form. The Datsun Go sedan which will be unveiled in Russia on the 4th of April will use the same 1.2-litre petrol engine as the Go hatchback and will be mated to a 5-speed manual transmission. The interior design is expected to continue unchanged as well. We do expect it to sport a longer wheelbase though and this should liberate more knee room for passengers at the back. Also, the rear seat inclination will be more for added comfort. The Go sedan will come to India as well, and when it does, it will be cheaper than the likes of the Hyundai Xcent and the Maruti Suzuki Dzire, it will compete against. The car is expected to measure under 4 metres to take advantage of the excise duty norms for small cars. As for the significance of Russia, Datsun says, the launch in Russia is particularly significant for the global expansion of the brand as it is a key market that offers Datsun great potential for growth. Furthermore, it is the first time in Datsun’s history that the brand has been introduced to Russia officially. The car has been styled in Japan, while development has been carried out locally by an international team of talented engineers drawing on Nissan Motor Corporation’s 80 years of car manufacturing experience and technical expertise, Dastun said in a statement. Upcoming MPVs for the Indian car market! Is VW planning an Evoque rival?